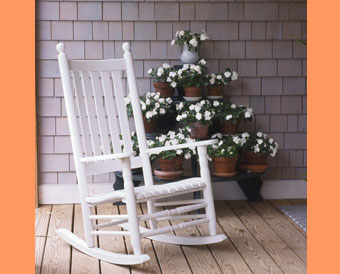 Porch rocker is positioned to offset a display of white impatients. One needs to sit here in just the right costume, a beautiful young woman in pale linen with a wide-brimmed straw hat in her hand. Not an old man in flannel or a scruffy adolescent in denimthey need to find another seat.